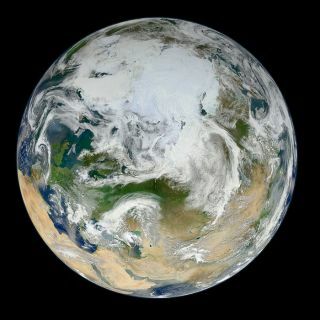 A view of the Earth's arctic as seen by NASA's NPP Suomi observation satellite. On July 3, 2014, the Earth will be at aphelion, its farthest point from the sun for 2014. With the Fourth of July holiday weekend nearly upon us, the national weather forecast for today, July 3, calls for high temperatures to hit at least 90 degrees Fahrenheit (32 degrees Celsius) from the Middle Atlantic states and points south through the Southeastern states and across the Deep South. So it may surprise you to find out the Earth is actually farther from the sun today than it is on any other day in the year. Scorching temperatures at or above 100 degrees F (38 degrees C) are expected across parts of California and southern Nevada as well as southern Arizona. In some desert regions, temperatures could soar to above 110 degrees (43 degrees C). Temperatures of 90 degrees F are also expected over the Southwestern states and points north through inland sections of Washington state and Oregon, as well as Idaho. During this annual milestone, the Earth is 3,104,641 miles (4,996,435 km) farther from the sun than it was on Jan. 3, when Earth was at perihelion, its closest point to the sun for 2014. The difference in distance between aphelion today and perihelion at the beginning of the year is 3,099,789 miles, or 3.28 percent. In terms of radiant heat received by the Earth, that makes a difference of nearly 7 percent. If you ask people in which month of the year they believe Earth is closest to the sun, most probably would guess June, July or August. But the warm weather doesn't relate to the Earth's distance from the sun. It's because of the 23.5-degree tilt of the Earth's axis that the sun is above the horizon for different lengths of time at different seasons. The tilt determines whether the sun's rays strike the planet at a low angle or more directly. At New York's latitude, the more nearly direct rays at the summer solstice of June 21 bring about three times as much heat as the more slanting rays at the winter solstice on Dec. 21. Heat received by any region is dependent on the length of daylight and the angle of the sun above the horizon. Hence the noticeable differences in temperatures that are registered over different parts of the world. When I attended Henry Bruckner Junior High School #101 in the Bronx, my Earth science teacher, Mr. Saul Shenberg, told all of us that because we were farthest from the sun in July and closest in December, such a difference would tend to warm the winters and cool the summers … at least in the Northern Hemisphere. And yet the truth of the matter is that the preponderance of large land masses in the Northern Hemisphere works the other way and actually tends to make the winters colder and the summers hotter! Interestingly, the times when the Earth lies at its closest and farthest points from the sun roughly coincide with two significant holidays. We're closest to the sun around New Year's Day and farthest from the sun around Independence Day. Actually, depending on the year, the date of perihelion can vary from Jan. 1 to 5 and the date of aphelion can vary from July 2 to July 6.